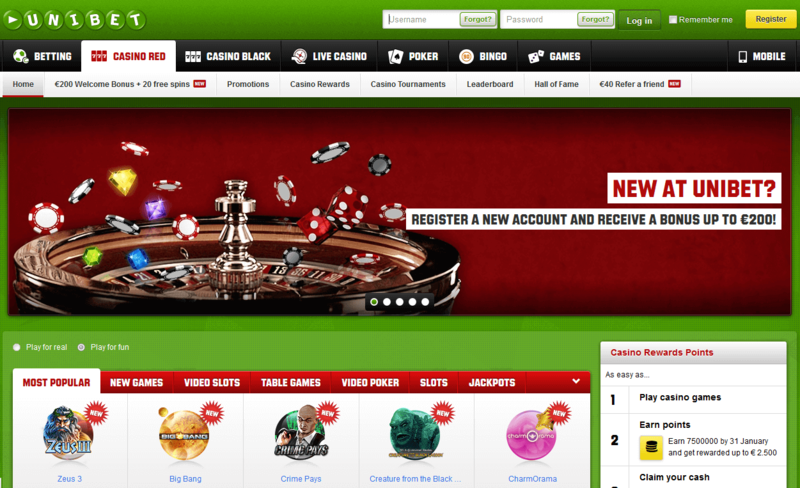 Established in 1997, Unibet is one of the oldest Netent Casinos. This gambling site has a lot more to offer than just casino games as Unibet.com provides a platform for sports betting, casino, games and online poker to over 7.6 million customers. Just as Net Entertainment, also Unibet Group Plc. is a publicly listed company at the NASDAQ OMX Nordic Exchange in Stockholm. With customers in more than 150 countries, Unibet is one of the bigger players in the industry with some big advantages as a result. To keep the players interested Unibet comes with promotions daily and progressive jackpots are growing faster. You can also expect an experienced customer service agents when asking for support, available seven days a week and 24 hours a day. If not by telephone, you can always ask for support via email or an international live chat. Looking for a Netent Casino, Unibet is highly recommended as not one Netent game is missing in this online casino. No matter what table game you prefer, all Netent table games are available, including the different variants giving you a wide choice in betting options. The same goes for the video pokers, also available in different versions. All scratch cards are there too, just as a wide range of classic slots. Of course the ground breaking video slots can’t be missed including rated games such as Starburst, Gonzo’s Quest and Jack and the Beanstalk. As one of the biggest Netent Casinos, Unibet is also offering its players a wide range of jackpot games including the all time favourite Mega Fortune video slot offering a minimum jackpot of € 1 million and responsible for the biggest jackpot ever won in an online casino. Besides Mega Fortune, Unibet is also offering other super popular jackpot games such as Arabian Nights, Gold Rush and Super Lucky Frog. And even though Unibet wasn’t part of the biggest jackpot win of € 17.8 million in 2013, many millionaires have been created while playing at this Netent Casino. Even before the real emergence of the live casino games started, Unibet has been a leader in offering these games. It didn’t take this gambling operator very long to realise live casino games are the future. Just as most live casinos, Unibet is offering the most popular table games Roulette, Blackjack and Baccarat, but also popular card games such as Casino Hold’em and 3 Card Poker have been added. Unlike most live casinos, Unibet has split this section in two parts, Casino Grande and Royale. You can contact the dealer through the live chat, no matter what live casino game you’re playing. Not exceptional for a Netent Casino, also Unibet gives you the opportunity to play all Netent games for fun by choosing the ‘fun play’ option. To see what games are highly recommended by other players, you simply have a look at the star rating. Have a look at the casino promotion page to find out about the latest casino bonuses, free spins promotions and other promotions. Start your Unibet casino adventure with a 100%, €100,- welcome bonus, but that’s not all as you can also take part in the New Players Tournaments. One of the best extra’s Unibet is offering its players are the casino tournaments. Netent video slots lend themselves perfectly for these slots tournaments, giving you the opportunity to earn some extra bucks while playing your favourite Netent video slots. As one of the pioneers in gambling, Unibet is always following the latest trends which also involves mobile casino games. When you’re in the possession of an iPhone or Android phone, you’ll be able to play your favourite Netent games as a Touch game simply by opening Unibet’s mobile casino from your smartphone or tablet. After you’ve logged in you can make a choice out of 20+ Netent Touch® Games. I highly recommend Unibet for those players who love to play the Netent games, but also like to bet on sports, play online poker, games and online bingo. In the beginning of 2014 Unibet changed the website completely in an attempt to make the site more user-friendly. I actually like the new website as some old user problems have been solved. If more organised, I’m not sure about that yet. But just as it takes time to get used to a new smartphone, tablet, laptop or car, I’m sure the new lay-out will make sense at one point too. At least the former two game sections Casino Red and Casino Black became one online casino, including all quality games designed by Net Entertainment.